• First degree, second degree, third degree burns: How can you tell? • How should you calculate the total body surface area of burns? • IV fluids: what kind and how much? How can you tell when you've given the right amount? • Wound care: when should you debride blisters, and should you use silver dressings? • Escharotomy: when must it be done? • Was it really an accident or was it abuse? • Referral: How do you know when to refer a patient to a burn center? The American Burn Association (ABA) reports that nearly half a million people suffer thermal burns each year in the United States.1 According to World Health Organization estimates, as many as 265,000 people worldwide die annually of thermal burns.2 The economic burden of thermal burn injury is also substantial: In the United States in 2000, the annual direct-care cost of treating pediatric burns alone was $211 million.2 This does not take into account the economic impact of rehabilitation and long-term disability. Efforts to prevent thermal burns through regulation and public health initiatives have reduced the incidence in developed countries; however, burn injuries still account for approximately 0.5% of all United States emergency department (ED) visits annually.3 This issue of Emergency Medicine Practice reviews the guidelines on assessment of burns and how these assessments are used for optimal management of fluid resuscitation, in addition to the latest evidence on burn-wound care, pain control, and the criteria for referral to specialized care. A literature search was performed in PubMed using the search terms burn, burns, and inhalation burn. The search identified approximately 4600 original articles that were screened and narrowed to articles of highest quality evidence and relevance. Only articles with abstracts available in English were included. The Cochrane Database was searched for systematic reviews using the key term burn, which identified 11 articles. A search of the Database of Abstracts of Reviews of Effects (DARE) and Center for Reviews and Dissemination (CRD) databases did not reveal any unique publications not previously identified in the PubMed search. A search of the National Guidelines Clearinghouse identified 1 relevant guideline. The ABA Consensus Guidelines (2012) and ABA Practice Guidelines: Burn Shock Resuscitation (2008) were also reviewed. The former is a consensus statement, whereas the latter identifies the level and category of evidence upon which each of its recommendations is based. International guidelines from the World Health Organization and the European Burn Association were also reviewed. Overall, the clinical evidence on thermal burns is of moderate strength, consisting of relatively few large, well-designed clinical trials and many smaller trials and observational studies. When possible, recommendations in this article are evidence-based. Recommendations based on common practice or expert consensus are explicitly noted as such. Systemic prophylactic antibiotics do not benefit burn patients. Use topical dressings for local wound care. Treat with systemic antibiotics only if a clinically apparent infection develops. 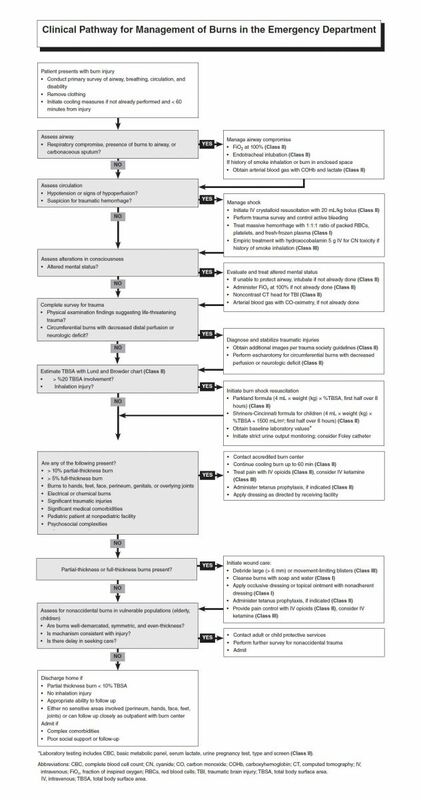 Use clinical endpoints, such as urine output, to assess and guide IV fluid administration. Formulas are merely a guideline, and IV fluid administration may need to be decreased or increased depending on how the patient responds. Burn patients are at risk for traumatic injuries and should undergo a comprehensive trauma survey and diagnostic testing per Advanced Trauma Life Support guidelines. First-degree burns are superficial and involve only the epidermis. Second-degree burns are partial thickness and involve the dermis. Third-degree burns are full-thickness and invade subcutaneous structures. If prehospital cooling has not been initiated, de­layed cooling in the ED may still be helpful. Physical examination findings are the only way for emergency clinicians to classify burns; however, they are only moderately reliable for estimating burn depth. Treat empirically for inhalation-related toxicity in unstable patients and those with altered mental status. When there is concern for cyanide toxicity from smoke inhalation, administer hydroxocobalamin 5 g IV. This is preferred over sodium nitrite and sodium thiosulfate. The Lund and Browder Chart should be used to estimate total body surface area (TBSA) burned. Other measurement methods (eg, rule of nines) are less accurate, particularly in children. Patients with > 20% TBSA burns rapidly become volume depleted. 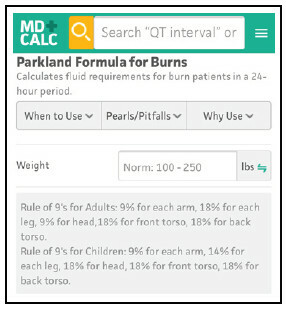 Use the Parkland formula (www.mdcalc.com/parkland-formula-burns) or modified Brooke formula to resuscitate with a crys­talloid fluid, such as lactated Ringer’s solution. Titrate fluid resuscitation to a urine output of 0.5-1 mL/kg/hour in adults and 1-1.5 mL/kg/hour in children. All wounds should be irrigated, and devitalized tis­sue needs to be debrided. Partial-thickness burns require a dressing. Avoid silver-based dressings, as they are associated with longer healing time. Emergent escharotomy should be considered if there is absent or decreased pulse oximetry, absent or decreased pulses, elevated compartment pres­sures, or new-onset neurologic deficits. There is insufficient evidence to recommend either prophylactic antibiotics or antibiotic wound dress­ings in burn patients. Be aggressive in the treatment of pain related to burns; opioids are typically used. In children, consider the possibility of nonacci­dental injury when their presentation to the ED is delayed or when burns are symmetrical, have clear upper wound margins, or appear with old or unrelated injuries. For more information on managing children with burns, see Pediatric Emergency Medicine Practice is­sue on burns at: www.ebmedicine.net/PedBurns. For burn-related nonaccidental trauma: www.ebmedicine.net/PedNAT. Do not include superficial (first-degree) burns in the calculation of TBSA. The presence of pain cannot be used to ex­clude a full-thickness burn. Prehospital cooling of burns (under cool run­ning water for ≥ 20 minutes) is associated with significantly decreased burn depth. Intubate early for burns to the upper airway or if there is airway edema, stridor, or other signs of compromise. Delay may make intubation impossible, as tissue become more edematous. Inability to ventilate due to chest eschar is an emergent indication for escharotomy. Avoid over-resuscitation and fluid-creep by monitoring vital signs closely. Thermal burn injuries are a significant cause of morbidity and mortality worldwide. In addition to treatment of the burns, emergency clinicians must assess for inhalation injury, exposure to toxic gases, and related traumatic injuries. This episode of EB Medicine’s EMplify podcast is hosted by Jeff Nusbaum, MD, and Nachi Gupta, MD, PhD. This month’s corresponding full-length journal issue of Emergency Medicine Practice was authored by Dr. Juliana Tolles of the David Geffen School of Medicine at UCLA and was edited by Dr. Boyd Burns of the University of Oklahoma school of Community Medicine and Dr. Christopher Palmer of Wash U.
American Burn Association Practice Guidelines. Available at: http://www.ameriburn.org. Accessed January 4, 2018. Ahrns KS, Harkins DR. Initial resuscitation after burn injury: therapies, strategies, and controversies. AACN Clin Issues. 1999;10(1):46-60. Access the Arterial Blood Gas (ABG) Analyzer. Access the Maintenance Fluids Calculation. Perform a comprehensive initial survey of a patient with a burn. Apply evidence-based interventions for resuscitation of burn patients. Assess and treat toxic exposures associated with burns. Identify patients who require referral to a burn center. Date of Original Release: February 1, 2018. Date of most recent review: January 10, 2018. Termination date: February 1, 2021. Faculty Disclosure: It is the policy of EB Medicine to ensure objectivity, balance, independence, transparency, and scientific rigor in all CME-sponsored educational activities. All faculty participating in the planning or implementation of a sponsored activity are expected to disclose to the audience any relevant financial relationships and to assist in resolving any conflict of interest that may arise from the relationship. In compliance with all ACCME Essentials, Standards, and Guidelines, all faculty for this CME activity were asked to complete a full disclosure statement. The information received is as follows: Dr. Tolles, Dr. Burns, Dr. Palmer, Dr. Mishler, Dr. Toscano, and their related parties report no significant financial interest or other relationship with the manufacturer(s) of any commercial product(s) discussed in this educational presentation.Dr. Jagoda made the following disclosures: Consultant, Daiichi Sankyo Inc; Consultant, Pfizer Inc; Consultant, Banyan Biomarkers Inc; Consulting fees, EB Medicine.